What did I do all day yesterday? I worked on an image for a client, developing a model in Sketchup, and created a three-dimensional building that I superimposed in a mountainous, old main street somewhere in West Virginia. It took me about two days to do. The next thing to do is to begin rendering it. My husband has a saying about rendering… it’s coloring when you do it for fun, rendering when you get paid to do it. Then, I woke up this morning dreaming about a bathroom renovation. I have started an Interiors Division within my firm that focuses on Sustainability. Having a lot of green research under my belt, and continuing to try to fit low VOC, reused, upcycled, local materials, labor and products, I have been itching to apply my ideas somewhere. Then, all of a sudden, I am hired! I am renovating three existing bathrooms in one house. The home has an open, light and airy floor plan downstairs. Nice yellow colors with cobalt blue accents, large pillar candles sit on the kitchen table tucked behind a couch. The first bathroom is downstairs. The second and third are upstairs, with the slanted roof that feels like you’ve just walked into a bird’s house atop a tree. It is a little low, a little darker, so I am starting with an idea of opening the upstairs with light, and using the bathroom renovations to do so. I love being inspired by House Beautiful so I began to go through some of their bathroom photos and here is what I’ve come up with. 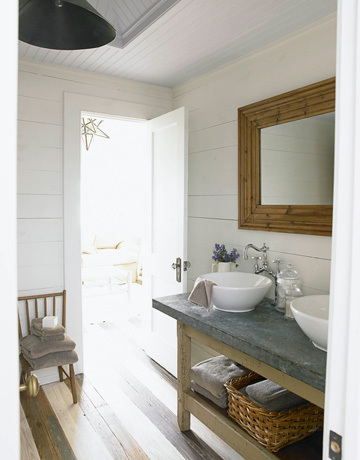 The client wants natural materials, and cannot decide if the two small bathrooms should be combined into one or stay as two with the option of being able to open up one to the other. Pocket doors, opaque windows, open truss ceilings with skylights or mirrors could do that. 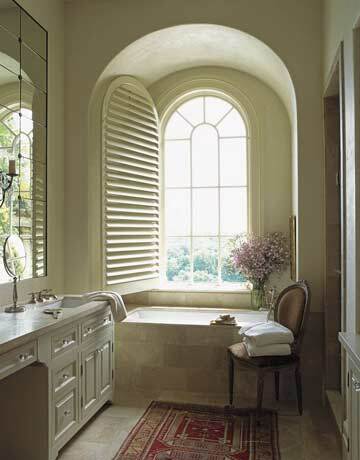 A funky light fixture or a sconce to brighten a corner could pull the focus to different places in the small rooms. Pedestal sinks with a continuous cantilever shelf above, fixtures that look like furniture, old stand alone tubs, open cabinetry, or a small armoire for storage. 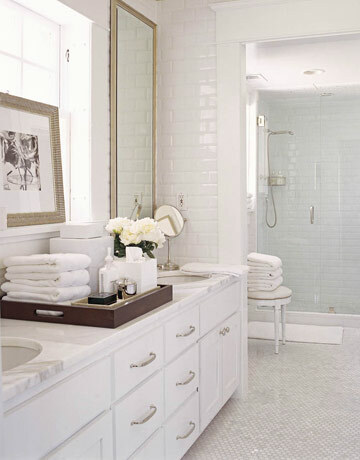 Updating a bathroom is an opportunity to introduce low-flow plumbing fixtures as well. I am going to propose a before and after water bill comparison. Where do you go for inspiration on projects? This dreaming stage is the most critical and the most fun. It is a small portion of what it takes to renovate, but is the direction of the project. The design idea should initiate enthusiasm to carry forward and prompt construction to complete it!